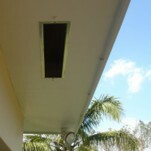 Soffit Vents used under the eave to provide ventilation to attic area preventing mold and heat build up. These custom made soffit screen vents are made with the highest of standards using .020 roll formed aluminum and fiberglass screen mesh or aluminum screen mesh. CUSTOM SOFFIT VENT Made from high alloy Aluminum framing with fiberglass mesh. 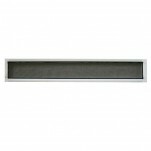 This under eav..
Aluminum Soffit Vent 4" x 16" .020 Aluminum Screen Frame Colors: Mill Finish, White..
Soffit Vent 6" x 16" Soffit vent dimensions: (outside) width 6" length 16" ..
Soffit Vent 7" x 16" Soffit Vent Dimensions (outside) width 7" length 16" t..
Soffit Vent 4" X 24" Dimensions (outside): width 4" length 24" thickness 5/16" Alum..
Soffit Vent 6" x 24" Dimensions (Outside): width 6" length 24" thickness 5/..
Soffit Vent 7" x 24" Soffit vent dimensions (outside) width 7" length 24" &..